Luxury vacation home with stunning ocean views and hot tub! You’ll be sure to enjoy your stay in this beautifully decorated hilltop beach house. Acorn Bayview Retreat is situated in the Cavendish resort area of Stanley Bridge. Just 5 minutes from Cavendish National Park and beach, as well as world class golf courses, fresh off the boat seafood and an abundance of small restaurants and shops. Our summer home overlooks New London Bay and the Stanley Bridge where you’ll see the lobster boats coming in after a days catch and the beautiful blue herons resting the water. We offer a fully equipped kitchen, as well as linens. You can dig for clams during low tide on one of the resorts 3 private beaches, tour the area and search for that perfect handcrafted gift from one of our Island Artisans or simply relax in the 6 person hot tub with a glass of wine and the beautiful sunsets. Whatever it is you choose to do, we are sure you will enjoy your stay at the Acorn Bayview Retreat. We are a family of 4 from Ontario Canada. My husband has family on the Island and we used to come and visit for a week every summer. In 2010 we started looking at properties and found our dream cottage! We love the views and the location. We are right in the tourism district but also private enough that we dont feel the busyness of the tourism season. We love the proximity to the beach for our kids and the quietness of the subdivision allows them to play safely outside. We love the light in this house and the views of the bay. The sunsets from the hot tub are incredible and the character in the home is wonderful with the high ceilings. The view from this lovely home is exceptional. Watching the sunset over the ocean is amazing and very relaxing. We truly enjoyed staying at your summer home. 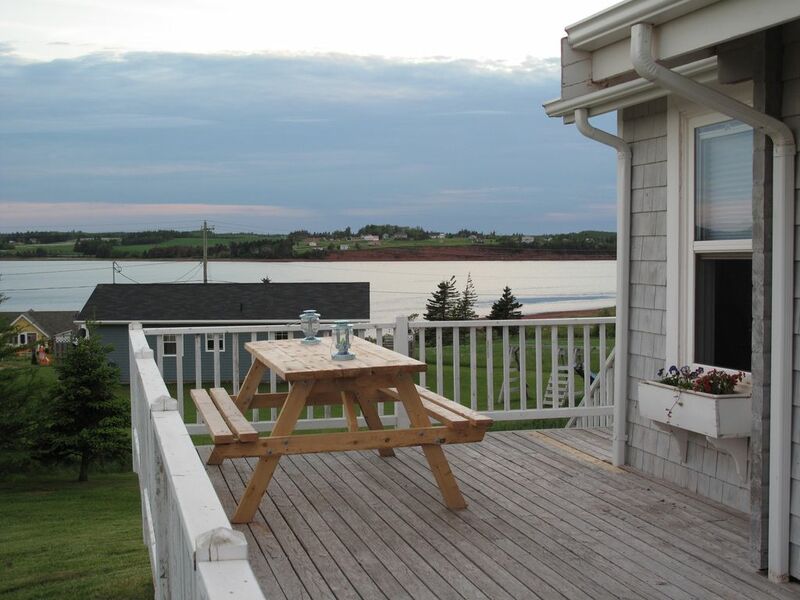 The home is located next to Cavendish and the beautiful Cavendish beach. This beach is amazing with white sand for miles. All other amenities of Cavendish are within easy access and I was amazed by all this beautiful island had to offer. Great restaurants serving tasty seafood and the COWS ice cream was my favourite. This home was heaven when you were done with your fun filled day in Cavendish or North Rustico. Very relaxing and very quiet. We enjoyed watching the sunsets in the evening and relaxing in the hot tub. We recommend your summer home to friends and family. Hope to return to the island and will definitely rent your home again. Thanks so much our island vacation was remarkable. Nice cottage in a peaceful area. Great location close to cavendish and many beaches. We had an amazing family vacation! Location is great, we did not miss anything in the house! The kids really enjoyed having the swing set and toys available for them. Garner & Deb were always available for us. Thank you so much Sarah for sharing your beautiful island home with us! Beautiful, well equipped cottage. Lovely view. Great for small children. Everyone loved the cottage and surroundings. Central. Great play area inside and out. Fantastic! Best spot on the island! This adorable cottage is absolutely the most relaxing and amazing place to spend your vacation! We are a family of 4 with two young kids and it is just moments from the Shining waters waterpark and cavendish stores! The cottage was super clean! Beautiful comfortable decor perfect for us and the kids! The yard has a play set for the kids which they loved!!!!!!! We loved the hot tub! Incredible place! Thank you for making our vacation special! This charming home with scenic views of the beach from the wrap around porch, was the perfect home for our 5 day stay in PEI. The home came equipped with all the amenities to meet the needs of our family (hot tub, coffee maker, tv, laundry, dishwasher etc). It was beautifully decorated with an authentic 'Island flare'. The location was perfect. We were a short drive to great local attractions, sights, restaurants, shopping etc. I would definitely stay here again, and would highly recommend this place to others who want the perfect place to stay in PEI! Our property is located right in the heart of the Tourism District. We are in a private subdivision with spacious lots and breathtaking views of the bay. If you are looking to stay close to all the area attractions but have all of the comforts of home and your own private space, then our cottage is for you!